As I pointed out last week, funding for British films was precarious by the end of the ’60s. Although it was still possible for a filmmaker to scrape together some money for a low-budget commercial venture like Don Sharp’s Psychomania, Ken Russell had to access American funds for his more ambitious projects. Outside the commercial mainstream, the British Film Institute had been funding independent and experimental films with small budgets since the early ’50s, eventually supporting some of the best and most important filmmakers of the second half of the century – people like Bill Douglas and Terence Davies – but the amount of money available was relatively small. Television was another source (the BBC and Channel Four in particular have supported a lot of feature production over the past thirty-odd years). But whatever the source and the degree of commitment to film as art, most of these sources needed to be concerned with such mundane matters as possible return on investment, which is no doubt why one of the most interesting films of the ’70s was unable to secure any financing from any of the usual suspects, with director and co-producer Peter Hall forced to find a more unconventional path to production. When Ronald Blythe published his book Akenfield in 1969, it became an unexpected best-seller. An oral history of a village in Suffolk, it created a richly detailed portrait of life in rural England from the turn of the century to the present. A work of poetic social history, it evoked the even longer story of the relationship of the English people to the land, a story steeped in the hard experience of manual labour and equally in mystical traditions which go back to the legends of Arthur and Camelot, of the druids and their even older ancestors who built circles of standing stones and other prehistoric monuments. This tradition has informed English art and literature for centuries – from Blake to John Cowper Powys, from Turner to Constable, and on up through the films of Michael Powell (The Edge of the World, A Canterbury Tale, I Know Where I’m Going) to Andrew Kotting’s Gallivant and This Filthy Earth, Patrick Keillor’s Robinson in Ruins and Ben Wheatley’s A Field in England. This blend of the physical and the mystical emerges from the mosaic of voices gathered by Blythe in his book, a large subject rooted in local specificity – but the book doesn’t immediately lend itself to the idea of a film adaptation. And yet renowned theatre, and occasional film, director Peter Hall felt an instant connection with the book because he, like Blythe, was a Suffolk boy and found his own history and experience embedded in those voices. He didn’t at first see how it could be done, but he embarked on a five-year process of turning the book into a movie. Collaborating closely with Blythe, Hall worked his way towards a process virtually unique in British film history. With the book distilled into a manageable structure, Hall essentially put together a cooperative of technicians and artists, all of whom would have equal shares in the finished film (if it could be finished), and eventually obtained some funds from London Weekend Television – not as producers, though, as he wanted his team to retain full rights. Instead, he sold the network broadcast rights, with the plan being a simultaneous television airing and theatrical release (perhaps the first such example of what has, forty years later, become a standard release strategy?). Hall’s production method was as unconventional as his financing plan. Although there was a kind of dramatic structure, he wanted to shoot the film like a documentary, using an entirely non-professional cast (which required a waiver from Equity) improvising scenes around the film’s various themes; and the shooting would stretch out over a full year in order to take in all the seasons, reflecting the rhythms of country life. For an organizing principle, the whole thing would be contained within a single day – the day old Tom Rouse is being buried; and the day that Tom’s grandson, also named Tom, is coming to his decision to leave the village, to seek a different kind of life elsewhere. But within that single day, the film would take in the larger flow of the entire century to depict the continuities and disruptions of lives tied closely to the land. 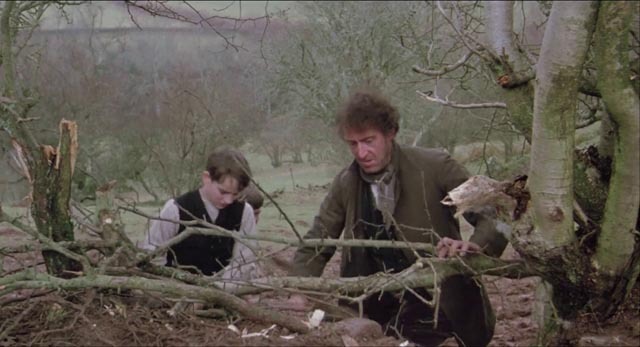 As the day progresses, with young Tom (Garrow Shand, who also plays his own father and grandfather) struggling against the forces which hold him in the village – his mother; his job (working for a local farmer); his fiancee, the local school teacher, who has no desire to leave the village – we see the people gather for the funeral, sombre before the burial, but gradually emerging into a more celebratory mood afterwards as they eat and drink and share stories of the life just ended. Woven through these events, the film moves freely back and forth through time; we see old Tom as a boy, as a young man courting and marrying a servant girl from a local manor; we see the ebb and flow of the couple’s life together, the bonds and stresses created by hardships and affection; we see old Tom’s son, also named Tom, meeting a girl at a dance in the village hall during the Second World War, a girl he marries and then leaves for the war, never to return; and we see the stresses which affect Tom and his mother, a tough woman who is fully immersed in the village way of life and doesn’t comprehend his restlessness and need to leave. There are a number of genuinely remarkable things about Akenfield, beginning with the performances of these local villagers; these people manage to play out the details of their own lives and those of their parents and grandparents with a completely natural, unselfconscious ease. 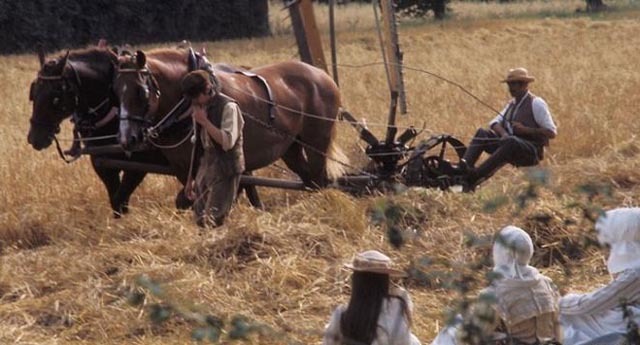 Even as scenes are created for dramatic purposes, they have a documentary authenticity – as do the recreations of the hard, sometimes joyful, work of rural life. The production bought a field from a farmer and in the Fall of the year, the villagers gathered for the harvest, using period tools, with Hall and his crew documenting the work as it progressed, following rather than directing this activity. When shooting was finished, Hall had some forty-five hours of material to work with and he and co-producer and editor Rex Pyke set about shaping it, just as a documentary filmmaker would, prising out the material’s meaning and building it piece by piece. According to Hall, the key to pulling it all together was layering the voice of Old Tom over what we see, the reflections of a practical man on the course of his life, unresentful even though he is aware of all the constraints which have narrowed that life. One thing which hangs over the whole film is the disruptive effects of war – both the First and Second World Wars – which paradoxically provided one of the few opportunities for local men to get away from the village and see something of the world. For young Tom, in the present, the ties to the land have been weakened, with mechanization and social changes undermining the kind of security the older, more rigid society had provided, making the idea of moving away not only more feasible but also, in some sense, necessary. The tone of Akenfield is elegiac. It finds both the beauty and the oppressive hardship in the old way of life, but also the uncertainty which comes from rapid change. Hall and Blythe resist any temptation to idealize or romanticize the past, but they also evoke the pleasures which could be found within the limited options available to people with little money and less property. 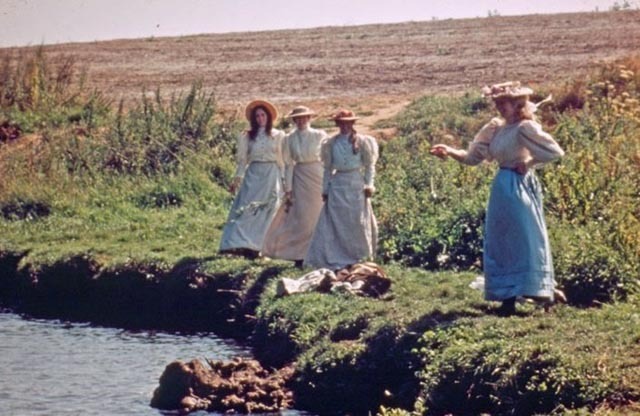 To embody all these rhythms of rural life over a century within a 98-minute movie is remarkable; to do it with such seeming lightness and ease is almost miraculous. And all of this was precariously dependent on chance – the reason it was so difficult to find financial backing. Hall of necessity had to rely on amateur actors working around their daily lives by shooting on weekends stretched over almost a year – and sometimes they didn’t show up, or their lives changed and they might suddenly be hard to find; he was at the mercy of the weather, with so much of country life taking place outdoors. He had his cameraman Ivan Strasburg shoot in available light, using a two-perf system which provided a widescreen image while effectively doubling the amount of time captured on film by giving two frames for every standard 35mm frame. But the combination of natural light and reduced frame area creates a grainier image and, in interiors, risks a lack of detail. Yet somehow Strasburg still managed to fill the frame with subtle tones and textures, giving the film a look which seems as natural to the eye as the unaffected performances; here, as in Hall’s direction, a high degree of art results in an effect of unforced artlessness. The film at every moment gives the impression of being found rather than composed. The context within which we first see something inevitably affects how we experience it. 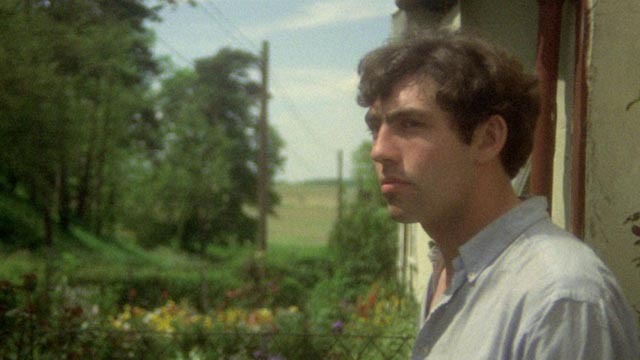 And so seeing Andrew Grieve’s adaptation of Bruce Chatwin’s novel On the Black Hill (1987) immediately after rewatching Peter Hall’s Akenfield probably does a disservice to the former and my comments about it may well be more critical than if I had seen it by itself at some other time. There are many points of similarity between the two films – they both span much of a century in the rural life of Britain (one in East Anglia, the other in the Welsh border country); they both deal with the continuities and disruptions across generations in a single family; they both cast a detached yet sympathetic eye on the mixture of beauty and hardship which characterizes those lives; they both reflect the effects of the two world wars on these constrained, local lives. They even occasionally share very specific imagery – in both, a character accidentally crushes underfoot a bird’s nest in a field. But in Grieve’s film the stylistic approach is very different. Here we have actors playing characters, not actual villagers portraying versions of themselves and their ancestors. Here there is no spontaneous improvisation, but rather a carefully constructed script, with a concomitant emphasis on composed imagery. The artistry of the two films resides at opposite ends of a spectrum and the documentarian in me responds more warmly to the lived-in naturalism of Hall’s work than to the more literary air of Grieve’s. Like Hall, Grieve was drawn to Chatwin’s book because it conjured up memories of his own early years and the landscape which had helped to shape him. Unlike Blythe’s oral history, this was a novel, telling the story of twin brothers born on a small Welsh farm. Except for a brief separation during the First World War, Lewis and Benjamin Jones (played at various stages by two sets of actual twins: Aled Baker and Rhys Baker at age 6; Lewis Toghill and Huw Toghill at age 12; and by brothers Robert Gwilym and Mike Gwilym as adults) live out their entire eighty years on this small patch of rugged farmland. As they grow up, they bear witness to the struggles in their parents’ marriage, the gradual evolution of the decent, taciturn Amos Jones (Bob Peck) into something broken by circumstances and increasingly prone to anger and violence, their educated mother Mary (Gemma Jones) ground down until almost all traces of joy have been erased in her. There are conflicts with neighbours, conflicts with the English authorities who control the land, and endless conflicts with the weather – bitter cold, incessant rain and mud. And through it all, the twins are bound to one another in ways which prevent them leaving, and prevent them developing outside relationships. Even in old age, with both parents dead and the house to themselves, they still share a bed. (I couldn’t help but think of the Ward brothers in Bruce Sinofsky and Joe Berlinger’s documentary Brother’s Keeper .) These narrow lives are constrained by class and nationality, issues which not only adversely affect the family’s relationships with the surrounding community, but which even cause fractures within the home, with Amos distrustful of Mary’s English education and refinement. At one point, finding her asleep with a copy of Wuthering Heights in her lap (suggesting a more romanticized view of rural life), he strikes her with the book; he drags her away from the church where her father once preached and forces her to attend the harsher, more austere chapel which better reflects his gloomier view of life. There is a great deal in the film, of both incident and theme, but apart from a very brief opening set in the present, everything is told in strict chronology. While there are moments where Grieve makes connections which have a deeper resonance, much of the film feels too much like a catalogue of details rather than an unfolding of lives; it is one event followed by another then another, with too much simply skimmed over – an entire decade might pass with a single thirty-second scene. World War Two sees the brothers working the fields with the help of a German prisoner; a woman with a German accent appears and talks of having made studies of twins (an inadvertent or deliberate echo of Nazi experiments? For what purpose? And who is this woman and why is she visiting the village during the war?). Lewis shows her around the local church, where she jots down notes, and he makes a very tentative pass, which she quietly rejects. And then at night the brothers watch from their bedroom window while fires glow on the horizon as Coventry is bombed. Then in the next moment we’re in the ’50s. These lives tied to the rhythms and cycles of the land speed by and the dramatic or thematic purpose of individual scenes becomes obscure. 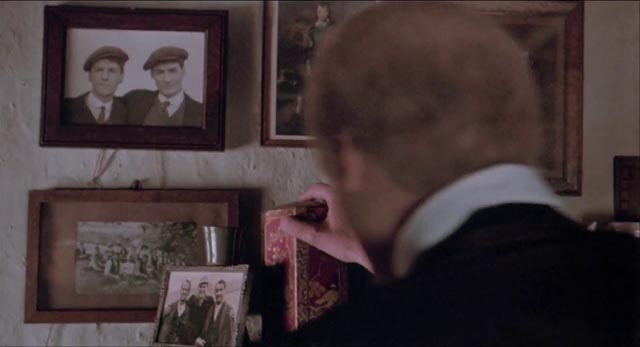 Nonetheless, it is photographed with a painterly eye by Thaddeus O’Sullivan, and the acting is good: Bob Peck’s Amos has some kinship with Pete Postlethwaite’s monstrous patriarch in Terence Davies’ Distant Voices, Still Lives (released the same year), although his anger is more clearly rooted in weakness; Gemma Jones is poignant as a woman who gradually has the simple pleasures she takes from life stripped away, coming to fear her husband and powerless to go against his anger. Robert and Mike Gwilym manage to remain convincing as they age from their late teens to eighty. 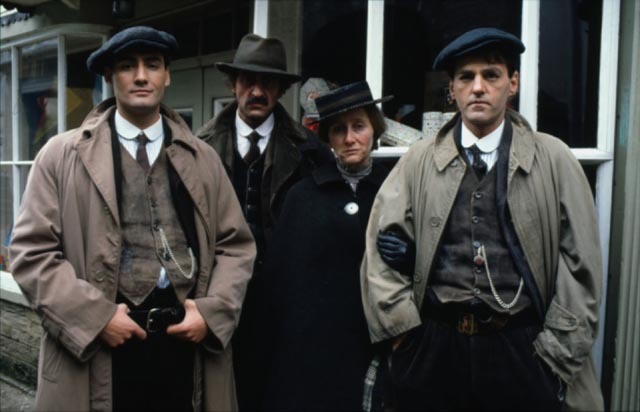 But for all its accomplishments, at least for me on a first viewing, On the Black Hill falls short of the richness of Akenfield. Yet, while Hall was rejected by the BFI and struggled for years to make his film, Grieve received funding from the BFI to shoot his first draft screenplay, the system having greater confidence in the less experimental project. 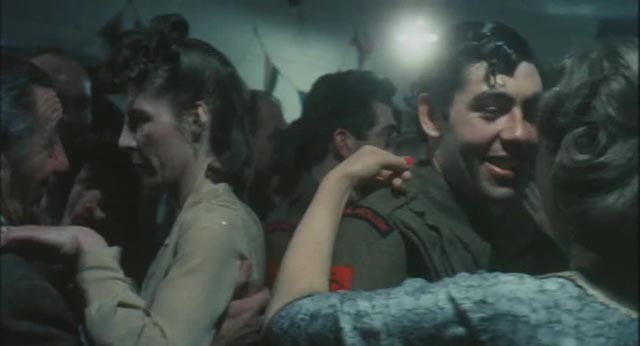 Both films have been issued in dual format editions by the BFI, each provided with substantial supplements, almost three hours on Akenfield, with almost an hour on the On the Black Hill disk. The Akenfield extras consist mostly of interviews, some from the time of the film’s production, others from 2004 and 2016. There’s a collection of footage shot behind the scenes on the first day of production, and an audio Q&A from the National Film Theatre which is accompanied by silent 16mm behind-the-scenes footage shot by Rex Pyke. On the Black Hill has an interview with writer-director Andrew Grieve (for some reason called an “introduction”) and two documentary shorts from the early ’30s: Shadow on the Mountains by Arthur Elton and O’er Hill and Dale by Basil Wright. There’s also a PDF copy of the script on the DVD. Both releases include a booklet with contextual writing. This entry was posted in Commentary, Review and tagged Adaptation, BFI, Blu-Ray, British Film, Directors, Docu-drama, Literary Adaptation. Bookmark the permalink.